This year I've only read 21 books, but I've probably listened to hundreds of hours of podcasts, and that's totally fine. Podcasts are such a great way to stay informed and entertained during the most tedious of times, like commuting and cleaning. I've listened to a huge amount of podcasts so I want to start doing these posts every now and then and hopefully you'll find your new favourite. I've discovered most of these this year and I've listened to nearly every single episode of all of them, and you should too. 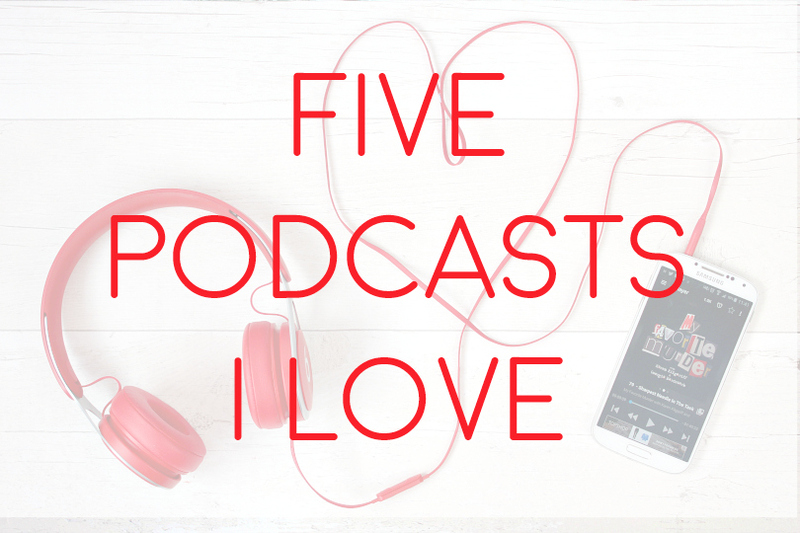 So let's get into it, here's five podcasts that I love. My Favourite Murder is exactly what it says on the tin. Every episode the hosts Georgia Hardstark and Karen Kilgariff cover one true crime (specifically murder, duh) case each. It's hilarious and terrifying and infinitely quotable. I've tried listening to a lot of true crime podcasts and very few match up to MFM in terms of likeability and humour, Georgia and Karen will keep you coming back as much as the true crime. Dear Hank and John is a self-described 'comedy podcast about death' from the Vlogbrothers, Hank and John Green. However you don't have to be a subscriber to their YouTube channel to enjoy this podcast - it definitely stands by itself. The Green brothers answer listener questions about everything from relationships to what is the largest animal that you'd feel comfortable fighting in hand to hand combat. They give dubious advice and it's ridiculous and profound and wonderfully funny. This is what I listen to when I want to feel light and happy for an hour and it also makes me look like a crazy person when I'm trying to contain hysterical laughter. Invisibilia is a podcast about the invisible forces that control human behaviour. Sounds vague, but it's brilliant. The hosts Lulu Miller, Hanna Rosin and Alix Spiegal explore ideas like categories, synesthesia, fear and lots more through a mix of scientific research and personal stories. Their voices are really soothing so it's great for relaxing but it also gives you a lot to think about. Now we're onto the fandom podcasts. These won't be for everyone but if you're really into specific things, then these might be worth checking out. Dusted was a Buffy the Vampire Slayer podcast that ran from 2014 up until recently. It's a beat-by-beat discussion of every episode of Buffy, with a particular focus on story - both episodic and longform storytelling. It's basically everything I ever wanted in a podcast. I recently did a big rewatch of Buffy because Stu had never seen it before and I listened to Dusted alongside rewatching and man, it was heaven for my intensely analytical mind. If you're a fan of Buffy, this is the podcast for you. The episodes only go up to mid season six because the hosts have since separated but one of the hosts has carried on analysing episodes in the podcast Still Pretty, which is great since I personally prefer her commentary. There are a lot of Harry Potter podcasts out there but Witch Please is my all-time favourite. The hosts, Hannah McGregor and Marcelle Kosman, are a pair of lady scholars who look at each of the Harry Potter books, films and everything surrounding them from a feminist standpoint. It's hilarious and so clever and wonderful and it just makes my heart happy. It's been about a year since I listened to the earlier episodes so I'm considering a re-listen. So those are five of my favourite podcasts! I'll definitely be back with another one of these posts but in the meantime, happy listening!